Ever go to the New York Auto Show and wonder where all those police cars on the lower level come from? They come from the New York City Police Museum. Incorporated in 1998, The New York City Police Museum is dedicated to preserving the history of the New York City Police Department, the world’s largest and most famous police service. Every year, they have a spectacular display of the police cars of New York City, from the 1930s to present day. 1958 Ford Custom 300 with factory 292i V8 (4.8L) and 3 speed automatic. Emergency equipment includes a Federal signal Model 17 light, Federal Signal Model 28 siren, Stewart Warner Police Special Speedometer and Motorola Twin V Police Radio. 1989 Chevrolet Caprice 9C1 Police Package with Federal Signal Aerodynamic 24H lighter and Federal Signal PA-300 radio. This car is built in tribute to P.O. Edward Byrne. 2016 Smart Car, with 89 horsepower and CVT transmission. NYPD installed options include NYPD specialized LED lighting and message board with 72 different programmed messages and a VIT fuel management system. 2016 Ford NGPI Utility, comes with 304 horsepower and al-wheel-drive with police tuned suspension, heavy duty wheels and brakes, NYPD specialized LED lighting, Rumbler siren, front push bumper, ballistic door and window panels, computer tablet with keyboard and printer, priority start (battery rundown protection), skid plate, AVL (automatic vehicle locator). It also has a park kill module, which turns the sirens off when the vehicle is placed in park, and a run on module, which allows the vehicle to run when the ignition key is removed but turns the car off when the brake is pressed so the car can’t be stolen. 1961 Plymouth Savoy from “Car 54, Where are You?”, with factory 318i V8 (5.2L) and 3 speed automatic, and Motorola Twin V radio, Stewart Warner Police Speedometer, Federal Signal Model 28 Siren and Federal Signal Model 17 light. Each car cost $2,694 in 1961. Ford has always been a staple in law enforcement vehicle history – going all the way back to 1919 when departments used Model T police trucks. Then, came the infamous Crown Victoria era in the early 90s and late 2000s. Now, we have the new Explorers and Tauruses we see most departments using on the roads today. Ford is taking their dedication to law enforcement one step further, and will now be offering doors that protect against armor-piercing bullets. Since 2008, they’ve offered factory-installed ballistic panels on their police car doors, but they only protect against handgun fire and non-armor piercing bullets. Only about 5 to 10 percent of police vehicles sold by Ford have the optional ballistic protection, which costs about $1,500 per door. In this photo provided by Ford Motor Company, different types of ammunition used in testing are displayed, foreground, as a Ford Police Interceptor Utility vehicle sits parked in the background during ballistic testing of doors against small arm fire at the Livingston Conservation and Sports Association in Brighton, Mich. In this photo provided by Ford Motor Company, a Michigan State Police officer and a Ford engineer look at damage to a door of a Ford Police Interceptor Utility vehicle during ballistic testing of doors against small arm fire at the Barry County Conservation Club in Hastings, Mich. In this photo provided by Ford Motor Company, a Michigan State Police officer shoots at the doors of a Ford Police Interceptor Utility vehicle during ballistic testing of doors against small arm fire at the Livingston Conservation and Sports Association in Brighton, Mich. In this photo provided by Ford Motor Company, a Michigan State Police officer shoots at the doors of a Ford Police Interceptor Utility vehicle during ballistic testing of doors against small arm fire at the Barry County Conservation Club in Hastings, Mich. This photo provided by Ford Motor Company shows entry holes through the outer skin of the door panel of a Ford Police Interceptor Utility vehicle during ballistic testing of doors against small arm fire at the Barry County Conservation Club in Hastings, Mich. Controlling 60 percent of the US police vehicle market in 2015, Ford will be the first in the US to meet the Justice Department’s highest standard for body armor, which is the equivalent of a bulky SWAT team vest. The ballistic panels, which cover the majority of the door, have two layers. The first layer is made from ballistic-grade ceramic tile, which disperses the energy and starts to break the bullet into pieces on impact. The inner layer is made from aramid fiber, which is the same material used for Kevlar, and catches the shrapnel from the bullet. Bill Johnson, executive director of the National Association of Police Organizations said that “any kind of protection that can be added into the vehicles that officers are driving in is a great idea”, since officers are frequently targeted when they are in their patrol cars. Unavailable to the public, the doors are destroyed when police cars are scrapped so they don’t wind up in the bad guys’ hands. Engineering the doors proved to be a challenge since the added weight of the ballistic protection had to be supported by the hinges of the door, though they made it happen. Ford will continue to offer both non-armor piercing and armor-piercing protection doors for departments with different needs. Pricing for upgraded protection has not been announced. Police Interceptors: Check Your Mirrors! Since Ford has discontinued their Crown Victoria Police Interceptor, police departments have been scrambling to find replacements. For the last 20 years, police departments have relied on the Crown Victoria to provide them with the durability, safety and performance that they look for in a vehicle. 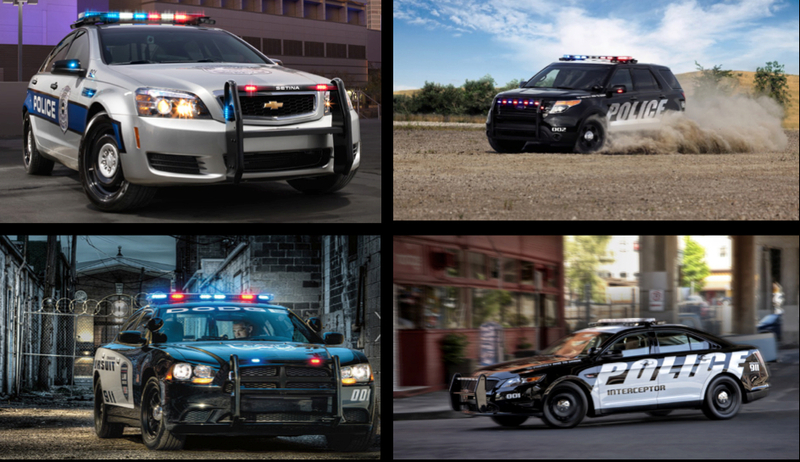 Now, several car manufacturers, Ford included, have introduced new police vehicles and departments all over the United States have been seen driving the new ones. Chevrolet has introduced the long-awaited Caprice PPV, but although there is no civilian model, the Caprice PPV is bound to impress. With a standard 3.6L V6 engine producing 301 hp, and an optional, albeit massive, 6.0L V8 producing 355 hp, the Caprice PPV has several configurations to suit the needs of each individual department. The Caprice PPV is able to achieve a combined 18-21 mpg (depending on the engine), which makes police department’s very happy. Other features include a best-in-class top speed of 154 mph, eight airbags (including ones for the knee) and a rollover detection system, and a 5-year/100,000 mile warranty. Although the Charger police car has been around since 2006, Dodge offered their new Charger Pursuit model in 2011. With a 3.6L Pentastar V6 producing 292 hp and an available 5.7L HEMI V8 producing 370hp, the rear-wheel drive Charger Pursuit had the best fuel economy in Motor Trend’s police vehicle test, offering 16/25 mpg for city/highway. The Charger was awarded a Top Safety Pick by the Insurance Institute for Highway Safety in 2011, 2012 and 2013. Ford now has two new police interceptors available: the Police Interceptor Sedan and the Police Interceptor Utility based off of the Taurus and Explorer models, respectively. Having passed a 75-mph rear crash test, the Ford Police Interceptors also have optional ballistic door panels to keep occupants safe. With police-tuned suspension, standard all-wheel drive and a reverse-sensing system on all models, the Police Interceptors have police work in mind! Both feature the 365hp, 3.5L EcoBoost V6 and the 2013 Police Interceptor sedan had the best 0-60 time (5.3 sec.) in Motor Trend’s police vehicle test, while still achieving 16/23 mpg. As gearheads, we all know what the Crown Victoria’s headlights looked like in our rearview mirrors. Now, there’s a whole new set of headlights to learn.